Web Analytics | Mac App Storeのアプリ検索・ランキング BuzzMac! 20% OFF for a limited time to celebrate the release! Web Analytics is a log analyzer for your web access logs. Unlike Google Analytics or other blog or CMS plugins, Web Analytics cannot be blocked by your users browser plugins like Adblock Plus or Ghostery: Whatever your web server delivers will be logged. Web Analytics is designed to dig deep into your website’s data, so it’s perfect to be used in addition to Google Analytics or similar services. • Apache Common & Combined Log Format is predefined. This works for most real life web access logs or gives you something to start with if not. • Create your own Import-Profile with a very supportive editor to fit exactly the log format your server uses. • Import unusual parts of your log specification into up to ten user defined fields - or skip them if you want to. • See the result of your Import-Profile while you are editing it by skipping through random entries of one of your log files. • Parse your log files first without importing to discover errors. Paste the erroneous log entry back into the editor for correction. • It only takes you 5 minutes to create a profile for a specialized log format only with Wikipedia knowledge of regular expressions. 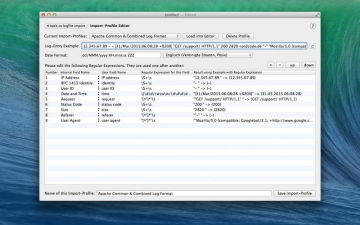 • Import a single log file or select a bunch of files from a folder with regular expressions. • Use the integrated FTP feature to download your log files first and import them in a second step to keep control over everything. • Or integrate the FTP download into your import process for easy one click download & parse. • Import preview shows you examples of the parsed data for review before you import them. • Create simple filters with a specialized editor or use predefined filters. • Combine your filters using logical and / or / invert as often as you want, to describe exactly what you are interested in. • Import and export your filters. • Use a specialized table to see every single data fragment of every log entry. • Apply filters to the data you see, exclude the fields you are currently not interested in. • Sort by column to select parts of your data, and use several selection tools. • Delete your selection, the filtered out log entries or the inverse of both, clear your data to find what you are looking for. • Find duplicate entries by calculated hash values during import. Select them and delete them if you want to. • Be in total control of your data. 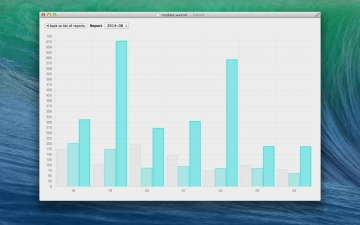 • Use your filters to create bar chart reports for every month of the year. • Choose between visits (count of entries) and visitors (unique IP addresses within this count). • Group three filters side by side in your report. • Window and fullscreen mode are supported. 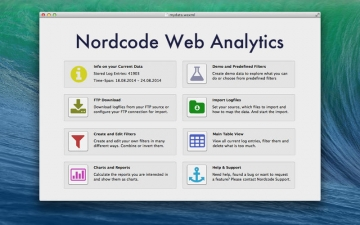 • 100% hand crafted native Mac application.